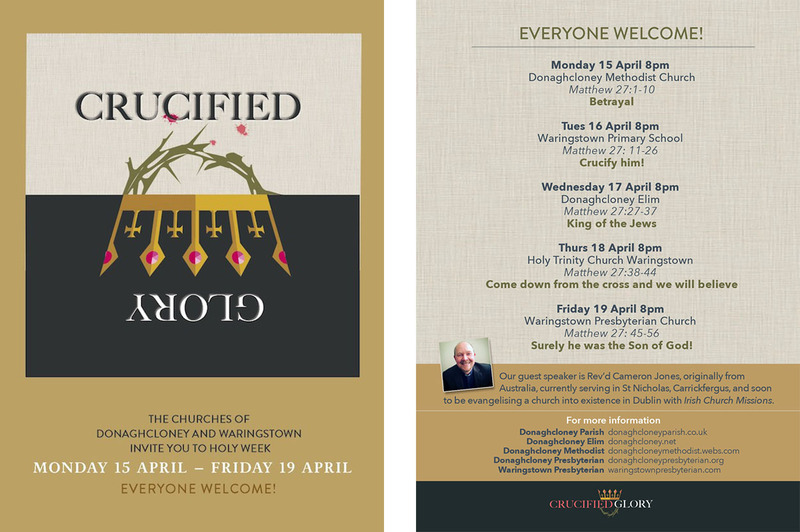 In the lead-up to Easter, from Monday 15th to Friday 19th April, a series of meetings involving the churches in the area will be held in different locations in Donaghcloney and Waringstown at 8.00pm each night. The guest speaker will be Rev. Cameron Jones, who hails from Australia, but soon will be serving in Dublin with Irish Church Missions. From 3-10 February, the General Assembly’s moderator, Dr Charles McMullen, is inviting us to join together in a special time of prayer. 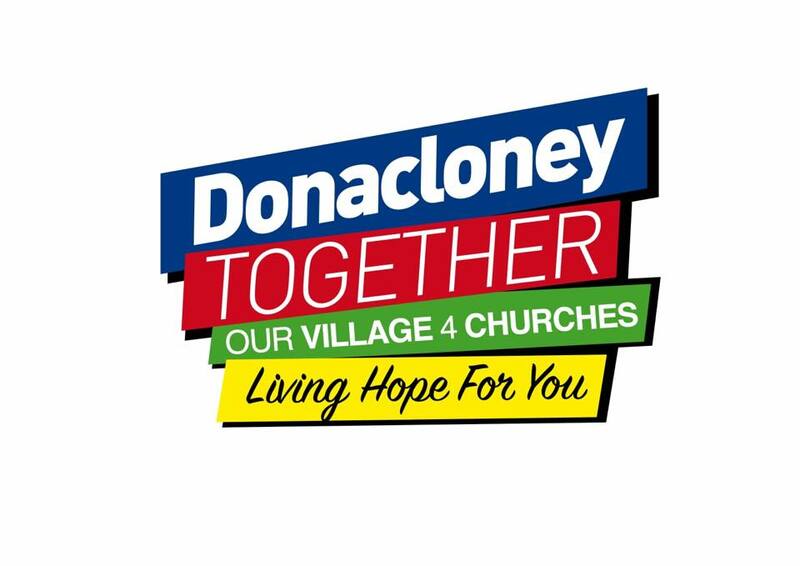 Donacloney Presbyterian Church will be holding meetings for prayer in the Magill Room on Thursday and Friday evenings at 8.00pm. Prayers on different themes - one for each day of the week - are available for download from the PCI website. More information, including videos, on the Week of Prayer may be found on the PCI website. Save the date! 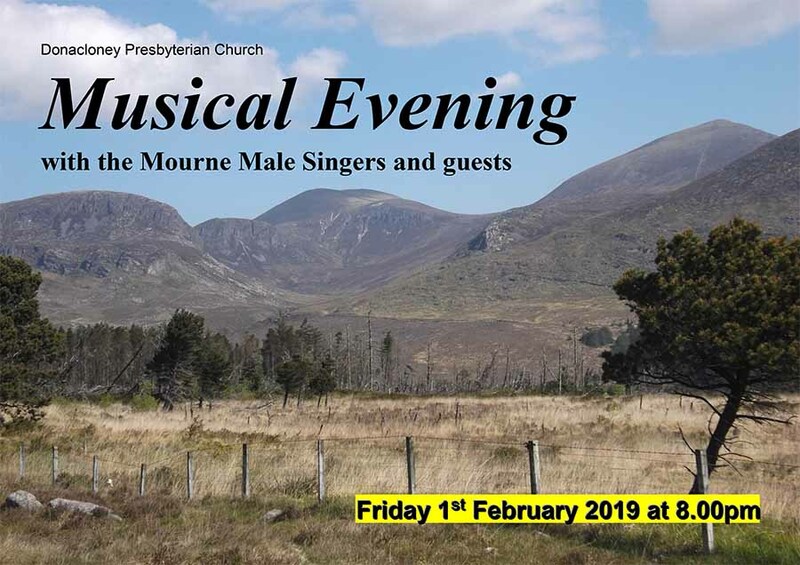 There will be a musical evening featuring the Mourne Male Singers, the McConnell Family, Lauren Moffett and guests in our church meetinghouse on Friday 1st February at 8.00pm. On the night there will be a special offering for the David Gordon Memorial Hospital, Malawi. Sunday 23rd December at 4.00pm in the Church Meetinghouse, followed by tea and mince pies in the Church Hall. A special offering for the Presbyterian Children's Society will be collected at this service. Tuesday 25th December at 10.30am. A special offering for the PCI World Development Appeal will be collected at this service. Information about this year's appeal, 'Seeking Safety', can be found on the PCI website.